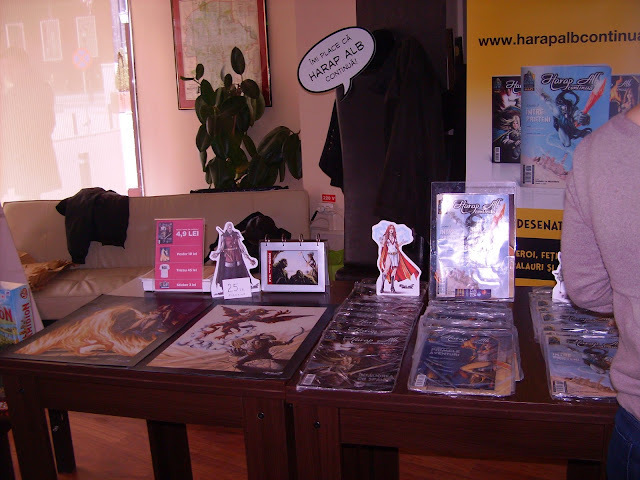 Between 23rd and 24th March, at Bucharest, the third edition of the Final Frontier, the Science Fiction and Fantasy Book Fair, took place and this year I had the opportunity and pleasure to attend this wonderful event. Final Frontier took place in a small location, but on the overall this aspect has little relevance. The important thing is that the Romanian speculative fiction in its entirety moves forward. The atmosphere was very pleasant and friendly, the writers, editors, publishers and readers shared their thoughts and changed impressions and ideas. 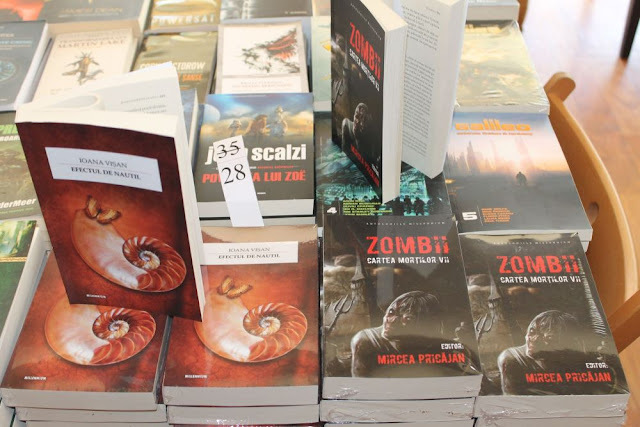 I was thrilled to see together the younger generation of speculative fiction writers and the established ones, people interested in the local science fiction and fantasy and new titles being launched, both local and foreign, on the Romanian market. The comic book, otherwise heavily struggling, shows promising signs with a new wonderful series, “Harap Alb goes on”, based on the well known Romanian fairy tale and featuring old and new adventures of the beloved hero and his companionship. Also, at this edition the presence of the Hungarian publishing house Ad Astra gave an international dimension to the event. Millennium Books, a landmark when it comes to the encouragement and medium offered to the local talent, came with two new titles, Ioana Vișan’s volume of short fiction, “The Nautilus Effect”, and the Romanian zombie anthology edited by Mircea Pricăjan, “Zombies: The Book of the Living Dead”. Another volume of short stories by a Romanian author, Florentin Haidamac’s “The SF Clinic”, was launched this time by the Cygnus Publishing House. Also a Romanian writer but with a volume published in English, Şerban Andrei Mazilu with “The Angellove Society: Crux”, had his novel presented again for the local readership. Tritonic Publishing House brought a new novel by Monica Ramirez, better known for her crime fiction, this time a cross between mystery and fantasy, “Double Life at Venice”. 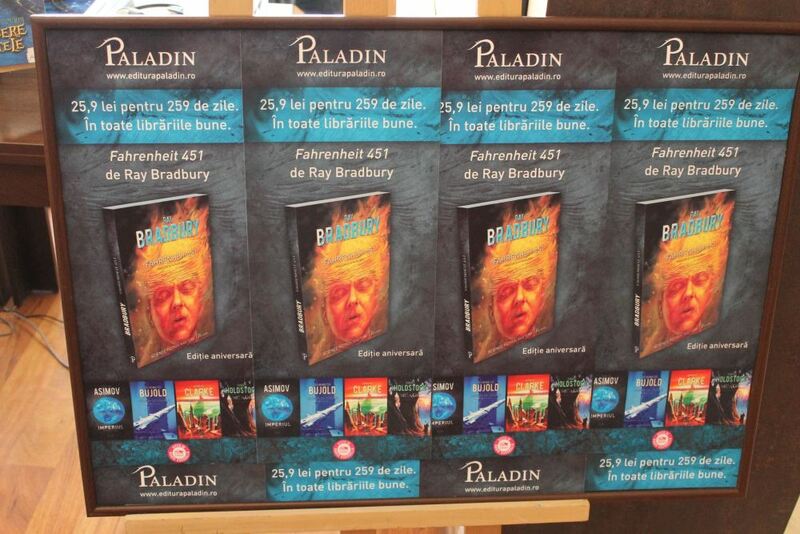 Paladin, the new publishing house specialized in science fiction and fantasy, launched Ray Bradbury’s “Fahrenheit 451” in a new edition. I would like to remark that this volume, as those already published by Paladin, comes in exceptional graphic conditions, rarely seen on our market. Nemira launched the Romanian edition of Paolo Bacigalupi’s “The Windup Girl” while Editura Trei came with Mary Doria Russell’s “The Sparrow”. During the two days of Final Frontier there were a few open panels talking about the general situation of the book market and the speculative fiction niche in Romania. “How can we convince the readers?”, “Writing comic book scripts”, “Translators-coauthors” and “The Science Fiction and Fantasy Magazines” touched interesting, but very sensible subjects. Overall, this edition of Final Frontier left me truly optimistic about the future of Romanian speculative fiction. Of course, by the look of Final Frontier everything on the local speculative fiction might seem heavenly and rosy, but the reality is far from it. There still are voices and people who wage petty wars for pretentious causes. It still springs forth from time to time an atmosphere of belligerence appropriate only for brushing up false super-egos. And since these two phrases gives them too much coverage already let’s leave them aside and hope that they’ll make their presence felt less and less in the future. Because, after all, the third edition of Final Frontier was a successful event, a celebration of speculative fiction that brought together writers, editors and readers from all over the country in a friendliest and pleasant manner. I am convinced that this wonderful initiative would only grow in the future editions and I personally will do my best to attend as many as possible. Thank you very much, Mihai. I hope you enjoyed the Book Fair.